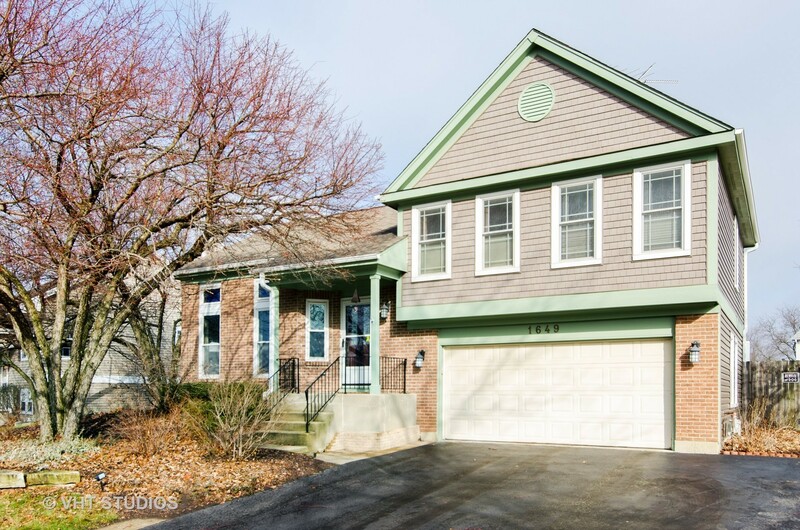 First, let's talk location...this nicely updated split level is walking distance to the elementary school & minutes to Randall Rd corridor which offers so many conveniences. Walking in you're greeted by vaulted ceilings & lots of natural light. The remodeled Eat-in Kitchen was designed with the Cook/Baker in mind- 42' cabinets, pull out drawers, corner cabinets, under & over head lighting & granite counters (no space has been wasted). Hardwood flooring under Livrm laminate flrs. Both bathrooms remodeled in last 9yrs (hall bath has a nice solar tube for extra light). Master bedroom w/vaulted ceiling, walk-in closet & private bath. Finished bsmnt w/cast iron direct vent gas stove offers additional living space. Spacious 2 car garage with additional storage. Large fenced back yard w/shed, spacious deck & concrete patio plus hot tub stays! Interior freshly painted, extra driveway side pad, siding new in 2017, roof new in 2009, appliances newer in the last 5yrs.